Striga, also known as the witch-weed, is a parasitic plant that infests cereal crops, often causing yield losses of up to 100% on farmers’ fields. In Eastern Uganda, the weed poses production constraints to upland rice cultivation. It is therefore urgent to manage this problematic weed in order to improve cereal productivity and enhance farmer livelihoods. As part of efforts to address community challenges through outreach, the College of Agricultural and Environmental Sciences (CAES) at Makerere University developed a Striga management project under the leadership of Dr. Jenipher Bisikwa-Isiko, a lecturer and weed scientist. The Striga management project forms part of a large consortium grant called ‘Striga Resistance Genes for Africa’ (STRiGA), funded through the DFiD-BBSRC- Sustainable Crop Production Research for International Development (SCPRID) initiative. The main international investigators of the project are Prof. Julie Scholes of the University of Sheffield (project coordinator) and Dr Jonne Rodenburg and Dr Mamadou Cissoko of the Africa Rice Center (AfricaRice). 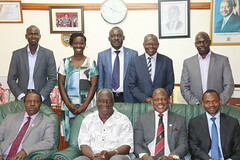 The project also involves a community-based organisation, Africa 2000 Network, Uganda. This effort builds on previous research funded by the Regional Universities Forum for Capacity Building in Agriculture (RUFORUM) Graduate Research Grants (Grant RU 2009 GRG 01: “Participatory management of Striga in cereal based cropping systems in Eastern Uganda”), which established baseline information for engaging communities in management of the witch-weed. The research team used farmer participatory approaches to promote adoption of Striga-resistant varieties. In this approach, farmers take part in the testing and adoption process of new technologies to ensure that the technologies developed are sustainable and adaptable to local farming conditions. Past technologies to control Striga were developed in isolation, without consideration of socio-economic factors that would affect their adoption. It is perhaps no wonder that they were not adopted by farmers. Twenty four upland rice germplasm were assembled from AfricaRice and tested in Eastern Uganda to identify adaptable, farmer-preferred, Striga-resistant varieties. A farmers’ organisation based in Namutumba District (Ebendowoza Ndala), a major rice-growing area in Eastern Uganda, volunteered to host the trials and actively participated in the farmer field days where they selected their preferred varieties. Using participatory variety selection approaches, the farmers -comprising both males and females- selected up to 9 out of the 24 varieties. The varieties selected were NERICA 10, SCRID090, NERICA 4, WAB 880, WAB 181-18, BLECHAI, NERICA 17, NERICA 2, and NERICA 1. In addition to Striga-resistance, the other preferred attributes that guided selection were maturity period, plant height, tillering ability, grain size, drought resistance, and yield potential. Based on the farmers’ positive response to the new rice varieties, the research team envisages a high demand for seed and hence need for a community-based seed system to facilitate easy access. For more information on this project, please contact the Team Leader, Dr. Jenipher Bisikwa-Isiko.